Sandwell Council has committed to making the mental health wellbeing of its staff a top priority. 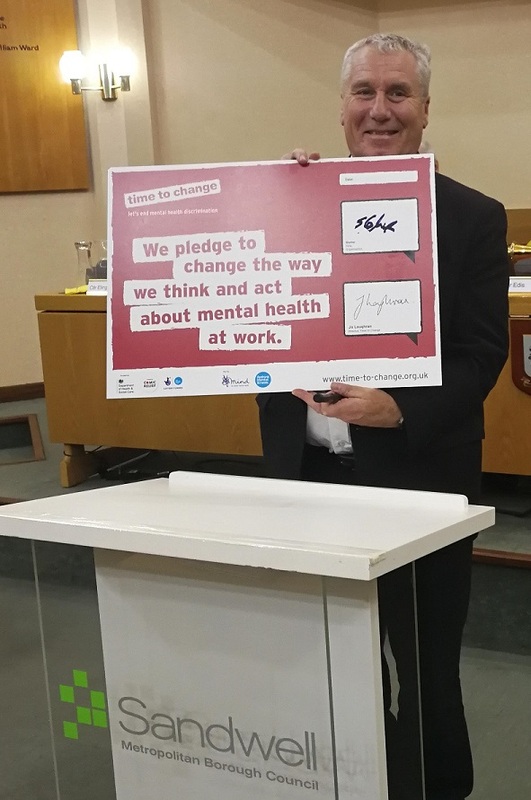 The council has signed the Time to Change pledge, which states employers will change the way they think and act about mental health at work. Sandwell Council leader, Councillor Steve Eling who signed the pledge on behalf of the council, said: "Sandwell Council takes the mental health and wellbeing of our employees very seriously. Lee Wiggetts-Clinton, spokesperson for the joint trade unions – GMB, UNISON and Unite, said: “We would like to thank Sandwell Council for supporting the Time to Change pledge which demonstrates commitment to a caring, supportive and productive environment to work in. “At a time of greater pressures in the workplace, we welcome this initiative to support staff who may face mental and wellbeing problems. “One in four of us will be affected by mental ill-health in any given year and we welcome the council’s recognition that mental health matters, and is taken as seriously as physical ill health. Time to Change, run by the charities Mind and Rethink Mental Illness, is England's biggest programme to challenge mental health stigma and discrimination.